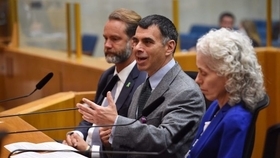 Dr. Mitchell Katz, a Brooklyn native who currently heads up the Los Angeles County Health Agency, faces daunting financial challenges if he's confirmed to lead New York's 11-hospital municipal health system. Mayor Bill de Blasio announced Katz as his choice today to replace Stanley Brezenoff, who took over as interim chief executive of NYC Health + Hospitals in November after the abrupt resignation of Dr. Ram Raju. "With renewed attacks on our healthcare by Republicans in Washington, it is now more important than ever to put stable leadership in place as we make progress on our plan to expand access to quality, community-based care throughout the city," de Blasio said in a statement. "NYC Health + Hospitals has made progress in expanding primary care and addressing immediate fiscal challenges," Katz said in a statement. "I'm committed to continuing these critical efforts." But to accomplish those goals, the system will have to make further personnel cuts and shift more care to outpatient services. Katz will need the mayor's support to bring financial stability to the health system, said Carol Kellermann, president of fiscal watchdog Citizens Budget Commission. "His success will depend on the latitude he is given by the mayor to make the changes that need to be made to get Health + Hospitals on a sounder financial footing," she said. "If his hands are tied behind his back on repurposing facilities and downsizing personnel he will face the same challenges that previous presidents have faced." Federal payments that aim to compensate hospitals for treating these types of patients are shrinking, with the health system expected to received $1.4 billion in fiscal 2020, down from $2.2 billion in fiscal 2016. Congress is currently considering legislation proposed by Republican Sens. Lindsey Graham and Bill Cassidy that drastically reduce Medicaid funding to New York state. Katz is currently in charge of a $7 billion budget at the country's second-largest municipal health system (New York's is the largest). He also oversees Los Angeles County's public health and mental health agencies. During his seven years there, he built out the health system's outpatient network and eliminated the system's budget deficit, according to the city's announcement. He also led a program that helped more than 1,000 patients with chronic illnesses get stable housing. Katz began his career in San Francisco in the early 1990s, where he headed the AIDS office of the city's public health department, before leading the department for 13 years. During that time he advocated for needle exchange programs as a way to reduce transmission of HIV. To avert the anticipated 2020 budget deficit, de Blasio laid out a transformation strategy in April 2016. It called for enrolling uninsured New Yorkers in the city's MetroPlus health plan, lowering its payroll through attrition and investing in outpatient care that could attract more patients, including those with commercial insurance. There have been recent positive signs. Health + Hospitals recently reported a $2.1 million budget deficit?a fraction of its $7.2 billion budget?during its most recent fiscal year, which ended June 30, according to a report by management to the board's finance committee. "L.A.​ health​ chief​ picked​ to​ lead​ city​ hospital​ system" originally appeared in Crain's​ New​ York​ Business.